U.S. President Donald Trump and Japanese Prime Minister Shinzo Abe meet during the U.N. General Assembly in New York, U.S., September 21, 2017. 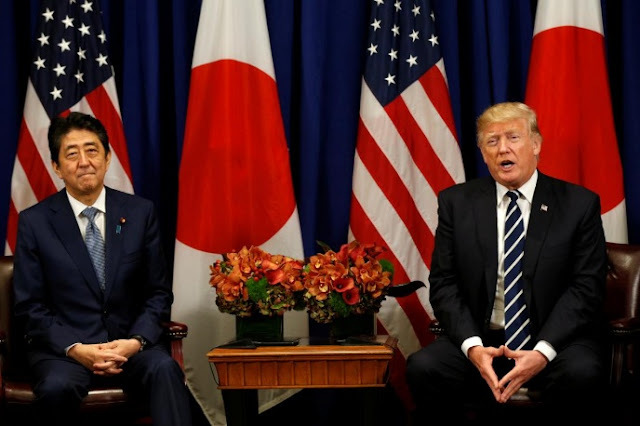 TOKYO - Japanese Prime Minister Shinzo Abe will hold phone talks with U.S. President Donald Trump on Wednesday to convey his condolences after the mass shooting in Las Vegas and to discuss North Korea’s weapons programs, a Japanese government source said. Tensions have grown on the Korean peninsula since reclusive North Korea conducted its sixth and most powerful nuclear test on Sept. 3, leading to a new round of United Nations sanctions. Japanese Prime Minister Shinzo Abe will hold phone talks with U.S. President Donald Trump on Wednesday to convey his condolences after the mass shooting in Las Vegas and to discuss North Korea’s weapons programs, a Japanese government source said.